So now you have a piece of our premium wool bedding and it needs to be refreshed and/or washed. Don’t panic, there are several options and some are super easy! 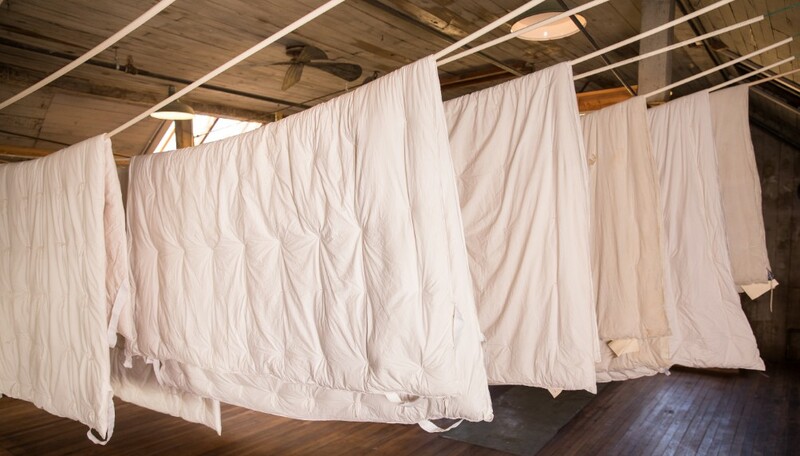 If your bedding has been used but isn’t soiled the best way to refresh your comforter is to hang it outside on a sunny, breezy day for about three hours. The natural UV light from the sun will kill any bacteria and it will come in smelling fresh and will be more fluffy. It’s almost a rite of passage for me when the first sunny, spring day appears in Michigan. My bedding goes right out onto the clothes line or deck railing. I love doing that ~ my bed is instantly more fresh and in my mind I know spring will start popping very soon. It just feels good. We have all heard the stories of how wool is near impossible to wash correctly. I’m here today to dispel all wool washing myths. Yes, wool can shrink ~ in the business we call that felting. It sounds so much better than shrink, doesn’t it? Felting or shrinking wool can happen a couple ways. The number one way that wool shrinks or felts is because it’s been agitated or twisted. Wool is a fiber with a natural crimp to it and in processing that crimp is somewhat straightened. If it’s agitated or twisted the wool will go back into its natural state and tighten up thus felting your beloved item. The other thing that wool doesn’t do well with is temperature change. If you wash in hot it should be rinsed in hot, likewise if cold water is used. Here at the Frankenmuth Woolen Mill we wash in bathwater warm water and rinse in the same temperature. If water temps are constant then you won’t have any problems. Now that you are equipped with what wool doesn’t like, here’s how it’s done. Empty tub and refill with warm water & fabric softeners if desired. Be sure to keep wash water and rinse water the same temperature. Drain water out-this can be done by pressing on the comforter. Do not twist or wring water out. That will cause shrinking. DO NOT! Do not machine wash or dry. This includes the hand- wash cycle on washing machines. Agitation and/or mild temperature change will shrink your wool comforter. Drop your comforter off or ship it to us.